Villa Sol e Mar is the perfect holiday villa in the perfect location! Comfortably furnished, spacious and fully equipped, with a great pool deck with outdoor dining and seating, and close to amenities, it is great for an informal family holiday, or if you want a private tranquil villa. The open plan lounge and dining area is spacious with comfortable leather sofas and large flat screen TV and dining table. There are floor to ceiling sliding glass doors that open directly to a covered seating area and the swimming pool and deck. It is a great outdoor space for lazing around in the sun or dining al-fresco. The fully equipped kitchen is adjacent to the dining area and opens out to the rear of the house where you have a super barbecue area. The villa has 3 comfortable bedrooms. The master bedroom, with dressing area and en-suite bathroom, has french windows that open directly to the swimming pool. The second bedroom has a double bed and the 3rd bedroom, 2 single beds. (For larger groups the Games Room upstairs has a single bed with a pull out 'drawer' bed and a very comfortable sofa bed). To keep you trim there is a treadmill, and for those that want a little pampering, a sauna. Up in the loft there is a huge, fantastic games room with table football, ping pong, pool table and large flat screen television, so entertainment for everyone. The pool deck is probably where you will spend most of your time lazing around. With sun loungers, sofas, table and chairs and barbecue, it is perfect for outdoor living. Pool heating is optional and costs 140,00€ per week for a setting of 24ºC, paid in cash on arrival. Pool heating should be requested at least one week in advance. Should it be requested after arrival at the villa, the minimum charge applicable is one week, which is payable from the time the heating is turned on. The nearest beach is just minutes from the villa. There is a cable car that take you up and down (2 Euro return), but in the quieter months it is possible to drive and park at the beach. It is possible to walk down, but not good for the knees! The village of Caniço is a couple of kilometres along the coastline, with a further selection of restaurants and bars, shopping centre and church square. Caniço de Baixo, at sea level has a lovely promenade and is a popular choice with the locals at the weekend. The advertised prices are based on a 4-person occupancy and supplements apply should additional people join you for any length of time. To secure your reservation, a deposit of 30% is required, or the full amount if within 8 weeks or arrival, and the balance is due 8 weeks prior to arrival. Should you cancel up to 8 weeks prior to arrival only the deposit is non-refundable, and within this period the full amount. You will be required to pay 1€ per person per night for all guests aged over 18 years old, up to a maximum of 5€ per person. This payment is required in cash at check-in, so please have it ready. Certificate of Excellence from TripAdvisor in 2018. En-suite to the Master bedroom with bath/shower, twin basins, wc, bidet. En-suite to twin with bath/shower, hand basin, wc. Family bathroom with shower, hand basin, wc, bidet. Shower and toilet for swimming pool/sauna Separate Toilet in Games Room. Outside: Villa Sol e Mar was designed for indoor and outdoor living. The swimming pool area is south facing with lovely sea views, spacious and equipped with sun loungers, dining table and chairs and sofas. There is a small lawn area and 2 barbecues. Utility Room: There is a washing machine machine, iron and ironing board. Cleaning / Towels / Linen / Maid service: All linen and towels are provided, including towels for the swimming pool. Other: Below the swimming pool is a sauna, treadmill and shower. There is a huge games room with table football, ping pong, pool table, large flat screen and comfortable sofas (which can also sleep 3 people - see bedroom configuration). We had a really great stay at this property. Everything was just as described. We found the kitchen very well equipped. the bedroom and bathrooms we used were excellent. The lounge and outside areas were great and the property was particularly clean.. I cannot think of anyway our stay could have been improved. Thank you very much for a great review. Very much appreciated. We felt very welcome as we arrived and got warmest service from Susan during our stay. House was way bigger than we tought and had everything we needed. Close to Funchal downtown, easy to find and stores nearby. Nice quiet area. Thank you very much for your 5 star reveiw. We would love you to come and stay again. We had a group of six people, my wife, brother and sister as well as two postgrowth representatives (both already adults). During the week we visited the Levadas and nature around the island. Botanical garden and Funchal also belonged to place of excursion. The location of the apartment was excellent for this purpose. Thank you very much for your feedback. We have to agree that the location of the villa is perfect for either exploring the Island or just spending lazy days around the pool. Great villa in great area! We stayed at this villa with friends in October 2018 and had a fabulous time. We all loved it. The villa is perfect and is equipped with everything you need for a really comfortable stay. It is very clean and has a great layout, with living area, kitchen and bedrooms on one level. Having 3 individual bathrooms was great and there were plenty of towels and extra bedding if needed. The pool and outdoor areas are wonderful. There are 6 loungers and an outdoor table which was great to eat al fresco! There is also a BBQ at the back of the property. We had the pool heated which I would recommend, as we were able to use it every day. There is a great games room upstairs which is ideal for families and friends. There is a sofa bed up there too, but we didn't need it. The owners Susana and her husband were so helpful and easy to work with and so were the property managers at Our Madeira. They all made the whole booking process and stay really easy. Although it is an uphill walk into Garajua, it is fine, and only takes 10-15 minutes and there are lots of restaurants, bars and ice-cream places to visit as a reward after walking there - then it is all downhill on your way back! There are plenty of supermarkets in Garajua too. A couple of nights we got takeaway food from Tourigalo, which was reasonable and very tasty. Right across the road from the villa is a little bar if you want a quick drink and snack or take the cable car down to the beach and try the restaurant there, it was great. For a couple of euros a local bus will take you into Funchal in about 15-20 minutes so you don't always have to drive either. Plenty of taxis in the area too. I wholeheartedly recommend this villa and hope to return in the future. We had a great holiday in Madeira. The villa is very clean and tidy with everything we needed. We loved lounging around the pool and taking the nearby cable car down to the beach. Would thoroughly recommend this villa. Magnificent villa, hyper equipped, according to description. 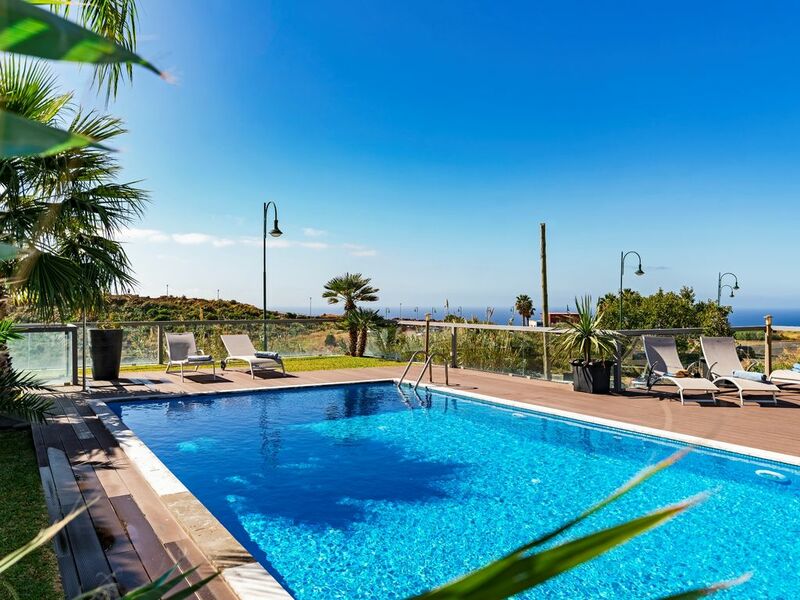 We enjoyed the sea view, and the location of the house, close to FUNCHAL. Everything was perfect, especially the games (billiards, babby foot, ping pong ...). Our next trip to Madeira will definitely be in this villa. Thank you for your super review. We look forward to your return visit. The cosmopolitan city of Funchal with its fruit & vegetable market, fish Market (the best morning to visit is Friday), marina and harbour, theatre, shops and restaurants is only 10 minutes by car. From golf to mountain biking to paragliding and big game fishing, Madeira has something for everyone. No matter where you go on the island you are rewarded by fabulous scenery, tiny villages and friendly people. The city of Funchal has grown over the years, ascending higher and higher up the mountainsides, resulting in a beautiful display of sparkling white buildings by day and a myriad of glittering lights at night. Booking Notes: To secure your reservation you need to pay a 30% deposit and the balance is payable 8 weeks prior to your arrival. Changeover Day: We do not have a 'fixed' arrival day, although Sunday arrival is only by request. Generally check in is after 15:00 and checkout at 10:00. This all depends on the reservations either side of your stay. We will try our best to accommodate your flight time. Notes on prices: The advertised prices are based on 6 people. There is a weekly supplement of €80 per person for the 7th and 8th guest.